England’s largest arts festival, Brighton Fringe 2014 is fast approaching, and we could not be more excited here at Brighton’s favourite Italian restaurant. The 4-week long Brighton Fringe festival is a celebration of all creative art forms, encouraging participation from fresh, new artists and acts as well as showcasing more established performers. It will run from 3rd May – 1st June and feature hundreds of diverse events at a wide range of venues across the city with performers coming from far and wide to be a part of the buzz that is Brighton Fringe. 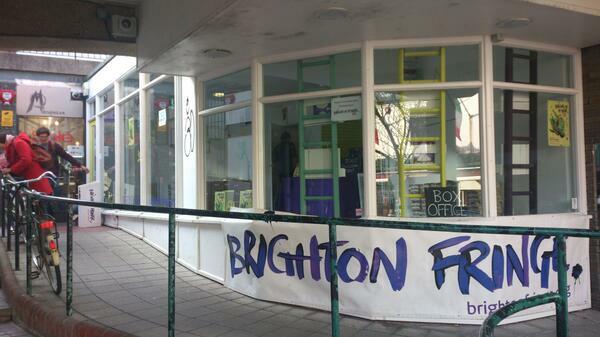 Donatello are proud to sponsor Brighton Fringe 2014, and festival goers can expect some fantastic deals, offers and giveaways while the Fringe is running. The reverse of any Fringe ticket will entitle the bearer to 10% off the bill at both Donatello and our sister restaurant, Pinocchio on New Road, making us the ideal place to go for a delicious pre-show meal at our famous great value prices. The Fringe Box Office opens today, opposite Donatello in Brighton Square and we’ll be there celebrating the launch and giving away free pizza slices from the restaurant around lunchtime. From today the Box Office will be open 10am – 6pm Monday – Friday and 12pm – 4pm on Saturdays. You can find out all you need to know about Brighton Fringe on their website HERE, which has comprehensive event listings, details for sponsors and volunteers, an overview of the festival’s vision, ticket sales and much, much more. Donatello and Brighton Fringe Festival 2014: The very best of the Brighton Buzz with authentic Italian cuisine and irresistible Festival offers.